This mural was found on Poplar Street in West Oakland. If there was an artist's signature, I couldn't read it. This and a partner mural are the first I've found with veiled women. Addendum: Greenkozi tells me this is by artist Jihad. I'll be away for three weeks but the meme will still go up every Sunday (unless I screw up). Wifi will be scarce so I'm unlikely to be able to leave comments. Ciao. Last week you saw this mural in progress. Here is the finished product. To the Women's Board, the gigantic white elephant is the pièce de resistance of the mural. The bicycle gives you a sense the scale of this mural. Below is the bird you saw sketched in last week's post. Below are two more sections from the far end of the mural. The artists are great guys who were more than willing to talk with folks who stopped by. 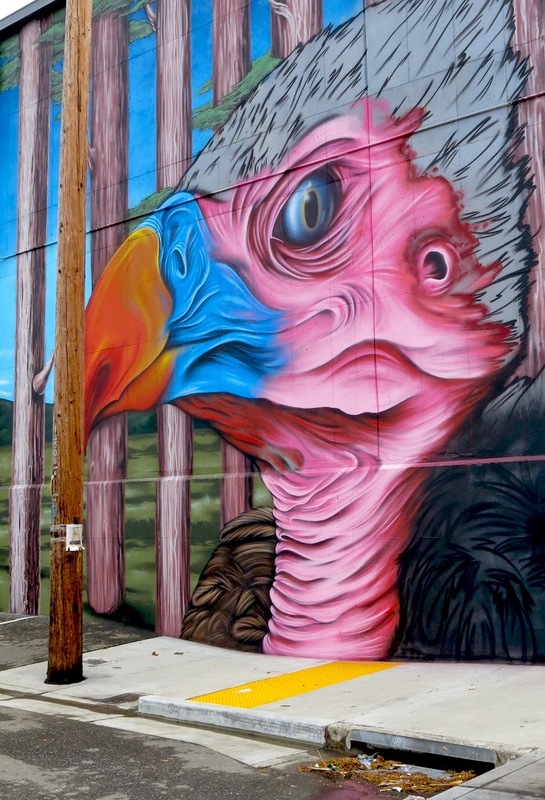 The White Elephant Sale, an annual event that supports the Oakland Museum, has commissioned a mural on the side of its warehouse. Doty, Griffin One, and Vogue, well-known street artists, are seen here creating the mural. Next week shots of the finished product. Another Craig Stuckey mural very near last week's post. I'd swear the dinosaur on the left is related to the dodo in Alice in Wonderland. Low tide reveals more than shore birds. Usually in celebration of Earth Day, the tires and other junk get plucked out of the estuary. While looking for murals in West Oakland I came across this building off Poplar Street. Granted it's not a pretty one, and neither is the photo, but you've got to admit this facade screams "squares." I'm guessing this building dates from the 30s and the door and tile were installed fairly recently to upgrade the look. The recycle can adds a certain je ne sais quoi. Click here to see City Daily Photo's participants in this month's Theme Day. Thanks, Jack for the heads up.